“Will you walk into my parlor?” said the Spider to the Fly. By the end of English author Mary Howitt’s often-misquoted 1829 poem, the vain Fly has allowed herself to succumb to the flattery of the patient and cunning Spider, and so ends up as his next victim. 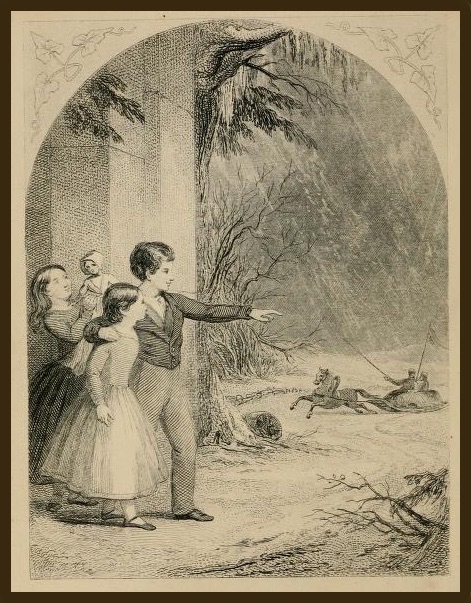 I consulted another of the 180-or-so works from the pen of Mary Howitt and her husband William, for what it might have to say about life in the Lovewell household in Athens County, Ohio, in the 1840’s. Best known for children’s books, Mary had written a month-by-month account of the activities of her own children which was published as “The Children’s Year,” a book her nieces and nephews in America found enthralling. Mary’s sister, Emma Alderson, decided to do something similar on her side of the Atlantic. Emma faithfully kept a journal of daily life at Cedar Lodge, the Alderson farm four miles outside of Cincinnati, describing the year’s events from the point of view of her children. In 1848 Emma’s husband Harrison sent the raw pages to Mary to review and edit. Mary Howitt published her sister’s journal in 1849 as “Our Cousins in Ohio,” a work which may have been intended to underline differences between life in England and in rural America, and now provides an enlightening glimpse into life as it once was lived along the Ohio River. Many details in the book are particular to the State of Ohio and the Alderson family, who were Quakers and therefore ardent abolitionists living within the boundaries of a free state. When the Aldersons meet former slaves who have purchased their freedom, runaway slaves bent on escaping from cruel masters, and occasionally, the original owners of the place, Shawnee Indians, they treat all of them as their equals. Sighting a train of “poor foolish recruits” on their way to fight the Mexican Army, the famously anti-war Quakers pity them as sacrificial victims being led to slaughter. Emma’s account can be occasionally frank and judgmental (Names are changed to protect everyone), as when she notes that many neighboring German immigrants had “almost a stronger prejudice against people of color than the Americans themselves." While there are generally no “thee's” or “thou’s” in the work, Emma's and Mary's faith may account for their consistent use of the word “sate,” an archaic form of “sat,” as in “One day, when she sate by her mother…"
Cincinnati lay at the opposite end of Ohio from the Lovewell home at Nelsonville, 150 miles away, but the daily routine at Cedar Lodge in 1846, the year chronicled by Emma Alderson, must have taken many of the same forms as it did in Athens County, the very same year when Thomas Lovewell took out a license to marry Nancy Davis and start his own family. Reading about life in Ohio in 1846 reminded me that it would be eleven years after that wedding, before the birth of Thomas and Nancy's only child who would survive to adulthood. The genders of the two antagonists in “The Spider and the Fly” may be a hint that the only death recounted in Mary Howitt's poem is the death of innocent maidenhood, but the cautionary ending still seems a downer for a children’s fable. Physical death hovers so palpably over the tales contained in “Our Cousins in Ohio” that it almost takes the form of a major character. “Death” appears in the book only 19 times, but “dead” and “funeral” also get 19 mentions each. There are 34 appearances by the word “died,” 36 by “grave.” Bear in mind that this is an account of a single year in Ohio-River country, and also a book intended for children, one brimming with sunshine and sweetness, marvels of nature, wide-eyed discoveries and delightful celebrations, perhaps made more precious because death is always standing off to one side or the other, waiting for an opening. July 4th was observed back then the same way we do it today, with a bang. Thanksgiving occurred on December 11 in 19th-century Ohio and involved no stuffing of either birds or celebrants. It was instead a day given over to pondering blessings and quietly giving thanks. Christmas was the big blow-out of the year. Emma Alderson and Mary Howitt describe two of them, the one at the end of 1846, but also the one just past and vividly recalled at the start of the year, when the journal opens. The Christmas which was just over, had been a very merry one. Instead of roast-beef and plum-pudding, there had been great roast turkeys and haunches of venison, and mince pies and dough-nuts, and sausages by hundreds of yards, and quails and geese, and candy and cakes, and toys and books, without end. On Christmas-eve, the children when they went to bed, left their shoes and stockings under the sofa. Willie protested that he had ho faith in St. Nicholas coming; but as Florence and Nanny believed he would come, he thought his might as well bear theirs company. In the morning they got up of course long before day-break, but all was empty and silent; and the mother suggested that, perhaps, it might be because the shoes were dirty. She had heard, she said, a great crack in the night, which Florence immediately thought must have been Santa Claus running away; more especially as something had scratched her nose in the night. How that might be I cannot tell; but sure enough Florence's dear little nose looked very red, and the little table was seen by day-light standing in a very mysterious manner in the window, covered with a cloth. When their father came into breakfast, the mother walked across the room, and all at once the cloth was gone from the table, and there was a surprise for the children. There was a large dish of cakes and candy, with mottoes, which their friends in the city had sent for them; and a knife for Willie from his father, and a slate and pencil; and a silk apron for Florence, from her mother; and a merry picture-book for Nanny, and many other things beside. Santa Claus had indeed been there; nor was little Nelly forgotten. The children counted their treasures over and over again; and then, finding that they had so much, they took a paper full of cakes and candy to Eberhard for his two little children, and another for Friedrich Lotte, and his little sister, because they wished to make these poor children as happy as they were themselves. The days at The Cedars, made joyous by the presence of that affectionate and wise mother, are now over for ever. This volume contains the brief record of her last Christmas on earth. Emma died at 41, but judging from the account of her final full year, like her Christmases, Emma Botham Alderson's time on earth was densely packed with love, good cheer, her good example and good works. Not a bad epitaph.